I love comic books. Heck, I launched this site on IGN years ago because I was that passionate. I’m a DC guy and I’m a Marvel guy. I love debating who’s the best X-Man ever (Jubilee, duh) and whether Flash or Quicksilver is faster (Flash, easily). Now, thanks to WizKids’ Dice Masters, I’m able to live out those debates, to pit Batman against Wolverine. It’s kind of a dream come true. Dice Masters is a clever deck-building game where, instead of building a traditional deck of cards, you’re building a pool of dice. Those dice represents energy (used to buy more dice and grow your pool) and characters you can field into battle. There are two aspects to any character in Dice Masters. There’s a card, which you choose at the start of the game, and character-specific dice, which you must "buy" during the game to add to your draw pool. The card represents a power for that character – and all characters have multiple cards, giving you some options. When you roll a die for, say Hulk, that die will either give you energy to buy more dice or will show the Hulk, allowing you to field him into battle. Throughout a game of Dice Masters, you’re rolling dice, choosing which dice to buy and add to your pool, and then fielding characters into battle to attack or defend. Each version of Emma Frost has a different ability. That’s about as deep as I’ll go in how to play here. What matters here aren’t the particulars of how you play Dice Masters, but the possibilities you can now unleash thanks to several new sets. 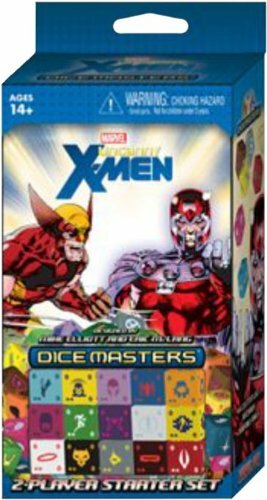 Dice Masters launched with Avengers Vs. X-Men and it was such a hit that WizKids immediately sold out and had difficulty restocking. Even from the outset, though, the potential was clear. You could create any team you wanted. If you wanted Quicksilver to fight alongside his daddy, Magneto, that was just fine. Or if you wanted Hulk and Spider-Man as a tag-team, why not? The Dice Master system is universal. There is nothing that requires this to be X-Men vs. Avengers or good guys vs. bad guys or even superheroes vs. other superheroes. Dice Masters can be mixed and matched. For a long while, that didn’t mean much. There were just Marvel characters to choose from. But this month, that all changed. Through the month of February, three completely distinct franchises will get the Dice Masters treatment. Yu-Gi-Oh, DC Comics, and Dungeons & Dragons. And all of them are interchangeable. That’s what’s so amazing about Dice Masters. Not only is it a great game at its core, but now you can create totally insane teams. The Punisher fighting alongside a dragon? Yeah, you can do that. Batman, Captain America, and a Beholder rolling into battle together? Yes! Comic books would never do this kind of crazy crap. But thanks to Dice Masters, you can feel like a kid again, mixing and matching your toys to create truly unique armies. Okay, so now you’re interested, but where to start? You need to begin with a starter deck. While the booster packs have the rare cards, you'll find that the starter decks give you enough cards and dice for a two-player game. Always get a starter deck first. Worry about boosters and other sets later. Play a couple of times with the starter deck, only using teams of four. Get accustomed to the rules and see what combos you can create. Then, go grab some amazingly cheap boosters. For just a buck you get two character cards and two matching dice. Not a bad deal at all. Spend ten bucks, get some new cards and dice. The dice... they call to you! Expand your games to include eight character cards per side in a battle. See how that feels. Learn what types of powers work for you and how to balance the cost of a die vs. its effectiveness when selecting you team. Then do the unthinkable… buy a starter deck from another universe. If you started with the DC Justice League, get a Marvel starter set. The Uncanny X-Men starters are pretty easy to find. Mix them in. Play. Enjoy. Expand. Kiss your savings buh-bye. Dice Masters is a wonderful addiction. I love it. And I can’t wait to see what universes I’ll be able to throw into the mix over the next few years.